The Things Network (TTN) is a LoRaWAN network specifically designed for more efficient device communication with the internet, minimal battery requirements, and a long range and low bandwidth protocol. You can learn more about The Things Network from their official web page. Using this Simple Setup Guide you will be able to stream your TTN data directly to Ubidots where you can further develop and deploy your IoT Solution for end-user engagement. Using the TTN + Ubidots official integration, there's no need to create webhooks and UbiFunctions to communicate. With this simple setup you now just need to provide your Ubidots TOKEN and your TTN data will be automatically sent to Ubidots! Read more of about Ubidots and TTN's joint effort to enable IoT Solutions. 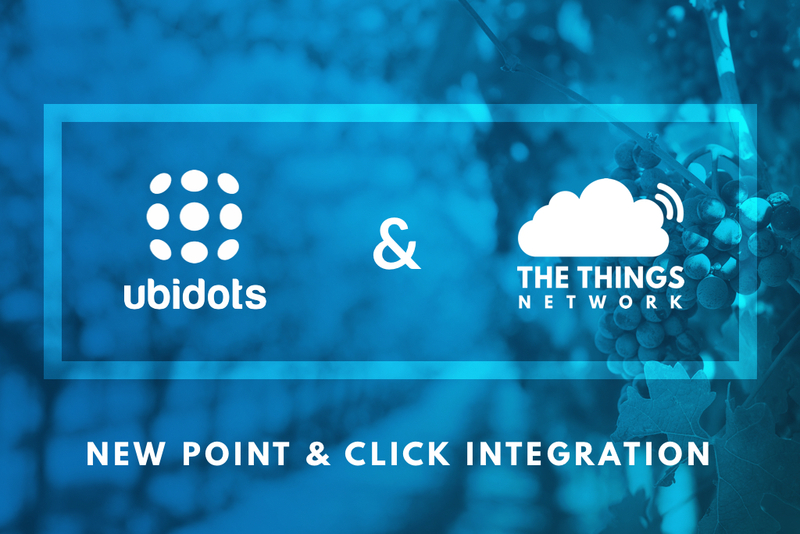 NOTE: The manual webhook integration from TTN to Ubidots can be found here. This manual setup utilizes the UbiFunctions add-on to decode a TTN payload. Low Power Area Networks (LPWANs) such as LoRaWAN have become a great option for IoT deployments thanks to their long range and battery-efficient communication. To achieve this, LoRaWAN devices transmit smaller data packets at low speeds, saving bandwidth and battery consumption. This means that most LoRaWAN devices are designed to transmit simple binary data payloads in bytes, as opposed to strings or text, allowing for smaller, more memory efficient packets and payloads. You may want to check out Ubidots API docs to learn more about acceptable payload structures for Ubidots platform. Luckily, TTN has a built-in tool called "Payload Functions", which allows you to decode binary payloads (in bytes) to JSON payloads. IMPORTANT NOTE: The management of data as bytes can be a little confusing at first, but this helpful guide will help you to better understand bytes. It is highly recommended that you review this guide and the video below if you've never decoded a byte payload. Now you're just 1 step away from seeing your data in Ubidots. 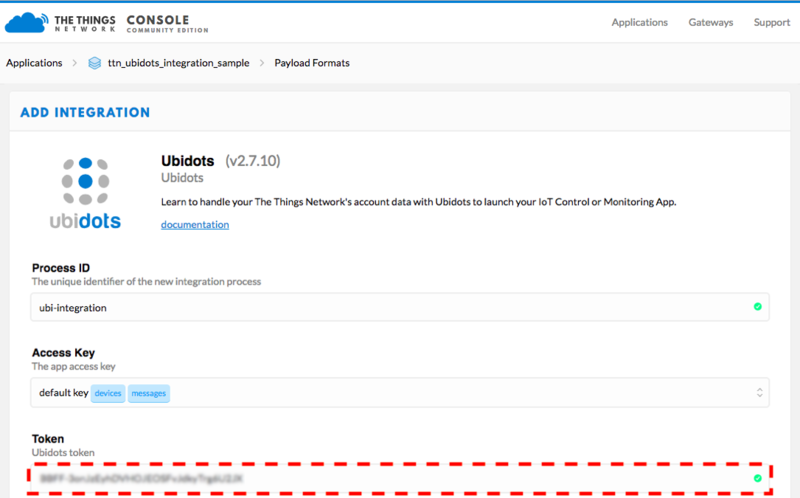 With the decoded active, click on "Integrations" within your TTN account, then click on "Add integration" and select "Ubidots." "Applications" –> "Integrations" –> "Add Integration" –> "Ubidots"
Next, give a customized name to your new integration (in this guide we simply called it "ubi-integration"). Then, select "default key" in the Access Key dropdown menu. The default key represents a "password" that is used to authenticate your application in TTN. Finally, enter your Ubidots TOKEN where indicated in the TTN user interface. 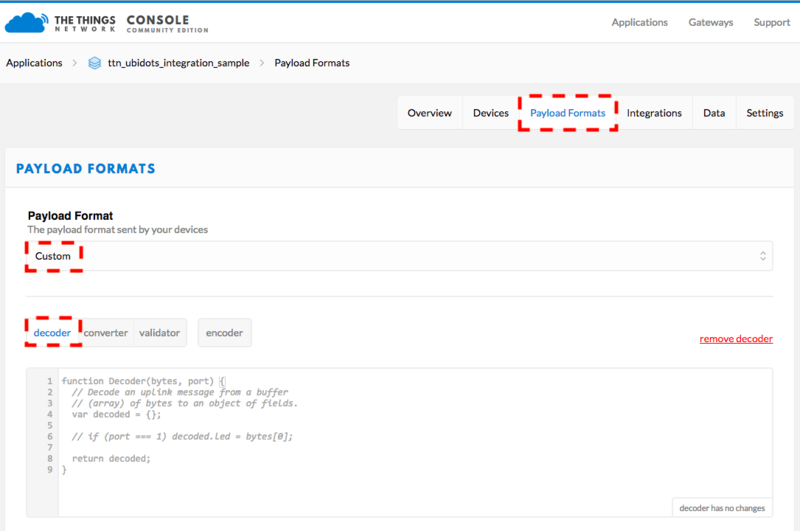 Finally, upon successful creation of the decoder for your application's data payload with the TTN integration, you will be able to see your LoRaWAN devices automatically created in your Ubidots account. In this article we have learned how to send data from TTN to Ubidots using the TTN's official integrations.